Basil plants that originated from a central coast nursery were recently found infected with downy mildew pathogen, Peronospora belbahri in a home and garden store in California. This is a new pathogen that can cause serious damage to culinary and ornamental basil plants. Symptoms include yellowing of the area between the veins on the upper leaf surface and growth of fungal mycelia and purplish grey spores on the lower surface. Yellowing on the upper leaf surface can be confused with nutritional deficiency, so careful examination of the lower side is important. 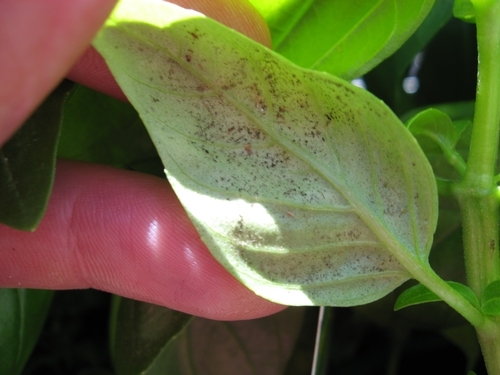 Basil downy mildew was first reported in the United States in 2007 in Florida and in several eastern states by 2008. It was also found in California by 2009. Infected seeds and plants are main sources of infection. Growers should try to obtain clean seeds. Spores can be dispersed by wind and close spacing and overhead irrigation can also aid in the dispersal of the inoculum. Regular monitoring of the fields for early detection of the infection and timely application of the fungicides is important for managing this disease. Proper ventilation and temperature control in the greenhouses is also critical as prolonged leaf wetness, high humidity, and cool weather promote the disease development.